The game is made by Bezier Games. 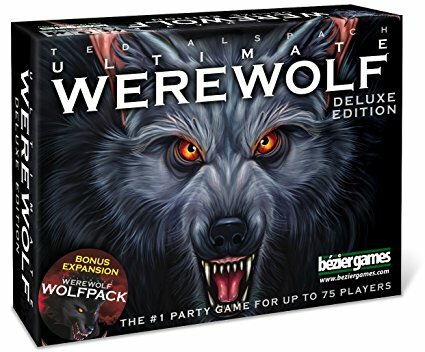 In Ultimate Werewolf, you and any number of other players (as few as 7 and as many as 75) attempt to figure out who is a werewolf over the course of several game days and nights. Each day you'll choose a player (hopefully a werewolf) to eliminate. Each night. ..the werewolves will eliminate a villager. Fortunately for you, some of the villagers have special powers, like the Seer, who learns the true identity of a player each night. The game continues until only villagers. ..or werewolves. ..remain. An updated reprint of Betrayal at House on the Hill was released on October 5, 2010.
Who among you can see through the lies? Who is capable of getting away with murder? Dead Men Tell No Tales is a co-operative game for 2-5 players. The game uses the common Action Point system to determine what a player does on their turn. With a twist. As players work together, they can pass their Actions on to their teammates in order to best utilize the assets that they have. Players will build the board as they play, ensuring that no two games will ever be alike. As they search the ship for the Treasure, they will encounter Enemies and Guards that they must battle, along with various items that will help them in their quest. all the while, battling the inferno that resulted when they took over the ship. Unique systems for tracking fire, enemy movement and a player's fatigue all combine into an interesting and unique cooperative gaming experience. "Puerto Rico's golden age returns. Through you! Players travel now to the capital city of this beautiful island. Who will build the most important buildings? Players build palaces, poor houses, silver smelters, gold mines, and many others - each with its own special features. The cleverest player will build well and win! As with the board game, players choose roles which can help all players, but the choosing player gets a special privilege with the role chosen. Players build buildings, produce and sell goods, and so on. The game is based on Puerto Rico, but different enough to give players new challenges and opportunities for fun and enjoyment. Fun. - a complete and fully playable roleplaying game ! Star Trek panic is a cooperative game where players take on the roles of the original crew members of the USS Enterprise. To win the game, players must successfully complete five missions and then clear any remaining threats from the game board, all while keeping at least one section of the hull of the ship intact. If at any point all six sections of the Enterprise are destroyed, players lose the game. You are about to begin your 5-year mission aboard the USS Enterprise. But which one? You can crew the classic Enterprise NCC-1701 or the next generation NCC 1701-D. ALERT! You and your fellow crewmates must cooperate to resolve dangerous situations that threaten to destroy your ship. If you fail, you all lose. Solving threats is the way you score points for your crew and win the game. Each crewmate has a unique ability. These abilities can help the team solve alerts. Use your skills wisely to give your crew the best chance at success. So, which is the crew for you-The Original Series, or the Next Generation?. Star Frontiers takes place near the center of a spiral galaxy (the setting does not specify whether the galaxy is our own Milky Way). A previously undiscovered quirk of the laws of physics allows starships to jump to "The Void", a hyperspatial realm that greatly shortens the travel times between inhabited worlds, once they reach 1% of the speed of light (3,000 km/s). The basic game setting was an area known as "The Frontier Sector" where four sentient races (Dralasite, Humans, Vrusk, and Yazirian) had met and formed the United Planetary Federation (UPF). The original homeworlds of the Dralasites, Humans, and Vrusk were never detailed in the setting and it is possible that they no longer existed. A large number of the star systems shown on the map of the Frontier sector in the basic rulebook were unexplored and undetailed, allowing the Gamemaster (called the "referee" in the game) to put whatever they wished there. Players could take on any number of possible roles in the setting but the default was to act as hired agents of the Pan Galactic corporation in exploring the Frontier and fighting the aggressive incursions of the alien and mysterious worm-like race known as the Sathar. Most published modules for the game followed these themes. Dungeons & Dragons (abbreviated as D&D or DnD) is a fantasy tabletop role-playing game (RPG) originally designed by Gary Gygax and Dave Arneson. It was first published in 1974 by Tactical Studies Rules, Inc. (TSR). The game has been published by Wizards of the Coast (now a subsidiary of Hasbro) since 1997. It was derived from miniature wargames with a variation of Chainmailserving as the initial rule system. D&D's publication is commonly recognized as the beginning of modern role-playing games and the role-playing game industry. Wow, what in the world does that even mean? This is a "Margarita and Cheese Dip" RPG! It is a game that doesn't take itself seriously, or anyone else for that matter. And it can be played by absolutely anyone, even those people who DON'T play traditional role playing games! Play with game designer Tom Wham, who will teach you how to play the as-yet-unpublished sequel to Dragon Lairds by Jim Ward and Tom Wham. An alien craft lands among the dragons. They overpower the aliens and begin building space ships to explore nearby planets. Dice rolling and meeple placement. CROSS is a clandestine spy agency also known as the Catholic Response Organization to Strategize and Strike. CROSS was created by rogue Cardinal James McDonnell to take the Pope's prayers and convert them into actions. He and his command staff create missions to protect the flock from evil using cutting-edge technology coupled with saintly magic honed over 2000 years of history.